If you have been looking at your kitchen for a while thinking it needs replacing as there are too many things wrong with it, think again. Our kitchen makeover service goes beyond spraying the doors, drawers and units. There are a variety of options to upgrade any other areas you are unhappy with. For example, we can spray your tiles a different colour or make you some bespoke resin or microcement spashbacks instead. Is your worktop looking dated or passed its prime? 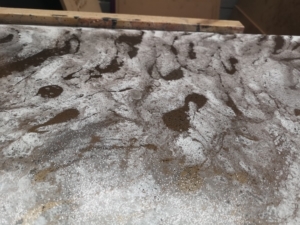 We can resurface what you already have and make it look both brand new and unique with a bespoke design service. Perhaps the handles on your kitchen doors are dated or losing their appeal. We can upgrade your handles while doing the doors and drawers. We can fill all the previous holes and refit in a new position. The possibilities are endless and all of it can be achieved by working with what you have and saving not only a significant cost, but also time, stress and mess. Your new kitchen makeover could be turned around in as little as a week. You can then spend the hard earned money you have saved on something else instead – like a holiday to Florida or a Jacuzzi for the garden! 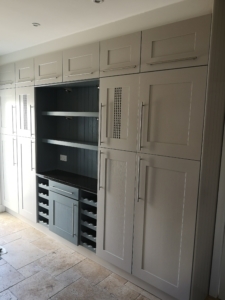 The point we are trying to make is your existing kitchen units and doors will come up looking like new and with the various makeover options available you will not even recognise it. Does it make sense to rip out and replace with something that will end up largely the same layout with just different surfaces? 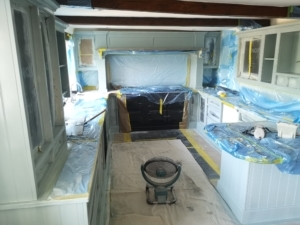 Let us do the resurfacing and give your kitchen the makeover it deserves. Take a look at our other services pages for more detail and pictures of what we have already achieved on other clients’ makeovers.